2 of 4 Whisk together flour, baking soda, cinnamon and salt. Set aside. 3 of 4 Beat butter and sugars until smooth. Beat in eggs and vanilla. On low speed, beat in flour mixture until blended. 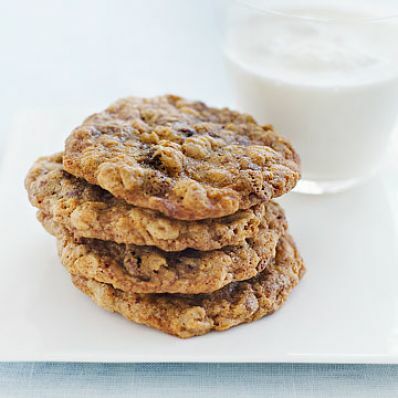 Stir in oats and chocolate-covered raisins. 4 of 4 Drop by well-rounded tablespoonfuls onto nonstick ungreased baking sheets, about 2 inches apart. Bake at 375 degrees for about 11 to 13 minutes or until lightly browned around the edges. Cool on the baking sheets for 2 minutes. Remove cookies to a wire rack; cool completely. Makes 36 cookies.